Jenny sent this excellent video of a local Blue Banded Bee Amegilla cingulata visiting Blue Ginger Dichorisandra thyrsiflora growing in her Mt Gravatt backyard. I was able to identify the Blue Ginger flower using the useful Flower Pictures site. Blue Ginger is not an Australian native, it comes from Brazil. However, it is a tropical plant and seems to be happy in Jenny’s sub-tropical backyard. Our local Blue Banded Bees certainly like this attractive Brazilian import, so it may be a valuable addition to Pollinator Link species and help create a wildlife corridors for our native birds, butterflies and bees. This transformation of our suburbs with more high rise unit building is definitely going to a challenge for our wildlife as well as existing residents. Though our Pollinator Link initiative we aim to build wildlife corridors using backyard and at the same time highlight the importance for maintaining a balance between more buildings and roads, and the green space so important for both wildlife and the health of residents. 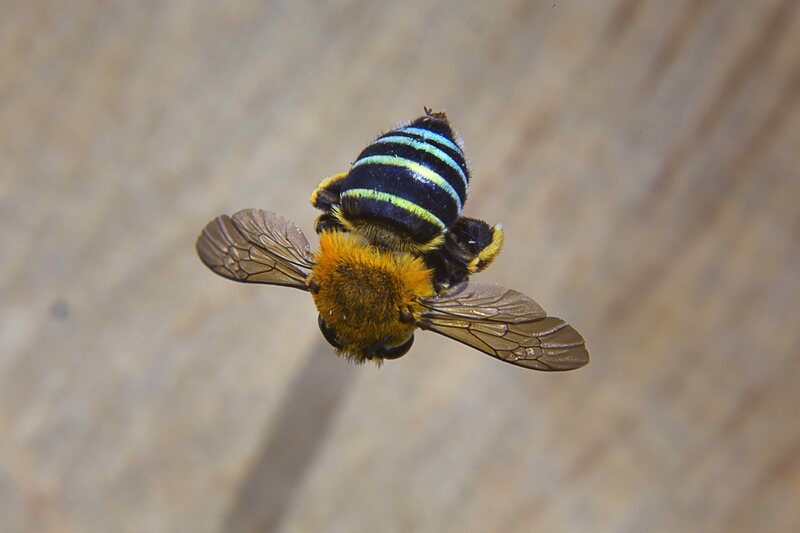 This entry was posted in Pollinator Link and tagged Alan Moore photography, Blue Banded Bee - Amegilla cingulata. Bookmark the permalink.